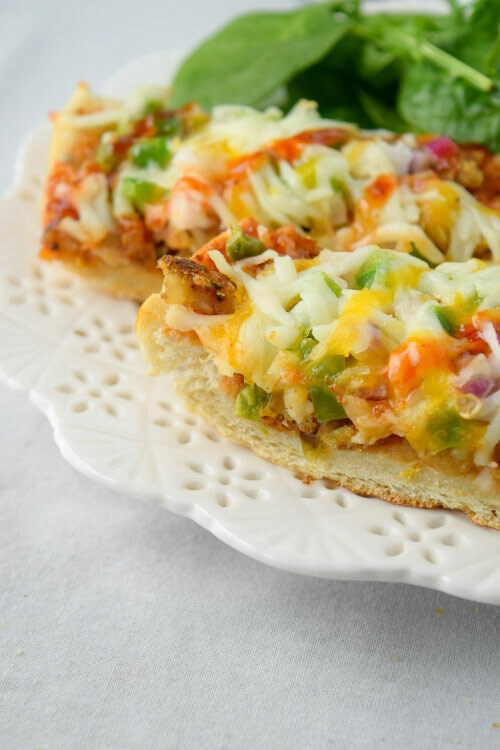 French bread pizza with a samosa filling. A meal your family will go nuts for. This is my new favorite meal. I mean what’s not to love about this easy meal. Samosa filling put on a french bread and baked to crispy perfection. Samosa meets french bread and makes a delicious pizza. I love this as if you are craving pizza but running short on time and still feel like having something homemade where you can control the ingredients and adjust as per your taste, this is your ANSWER to a quick homemade pizza which requires no dough. I was looking for an easy meal option. As you can see these days I am all about quick, delicious meals and this is on top of my list right now! I mean I am all over this. A delicious “my mom’s” (Let me tell you that her samosas are both of ours favorite!!) samosa filling is made here and then smeared on a french bread along with pizza ingredients and baked and there you have a meal fit for kings. I am telling you that your kids will go nuts for this! 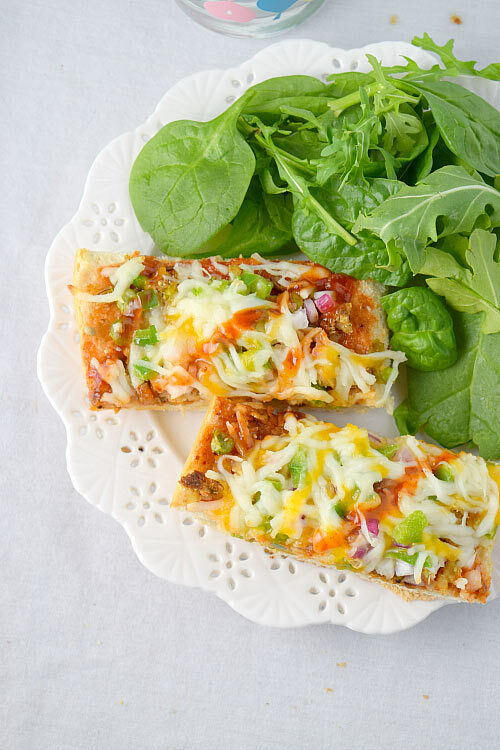 I mean this Samosa French Bread Pizza is a perfect Friday night dinner! Looking for more pizza options, look no more! In a skillet, add olive oil. Once hot, add cumin seeds. Once they start to pop, add green chili, ginger and saute for few minutes. Add green peas and cook for 5-7 minutes until almost soft on medium-low heat. To it add mashed potatoes and all the spices. Stir until all gets mixed. Cook for another 10-15 minutes with in between stirring until it starts to get cooked nicely. Taste and adjust spices as per taste. Keep aside. Cut your fresh bread in half. Smear both the halves with the maggi sauce. You can easily find this sauce in Indian grocery store. It is sweet with a nice kick but if you can't find, you can replace it with regular ketchup. Apply the potato mix on both the halves. Top them with little bit of cheddar cheese. Add bell pepper and onion and add more cheese on top. Bake in a 350F preheated oven for good 8-10 minutes until its crispy and cheese is melted. Serve immediately with extra sauce. I know right? I am loving this easy meal as well Denise! That looks incredible. Look at all those colours! These pizzas are so creative, Ami! I love the samosa filling toppings! Sounds delicious! Very creative take on pizza. I’m sure samosa filling will taste scrumptious on this crispy crust. It was Savita!! Thanks for stopping by! This looks so amazing!!! Love this recipe!!! I think this would be my new favorite meal, too! 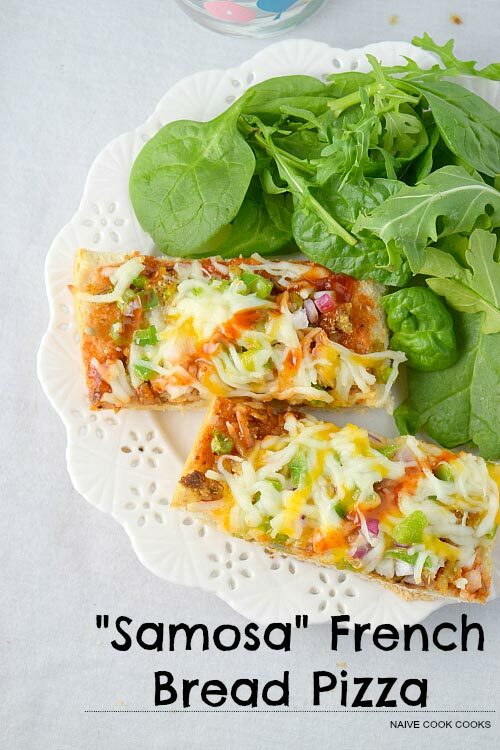 I love french bread pizza, and this version sounds delicious. Those toppings look perfect! Gayle you should try it then!! Wow, didn’t know the pizza could be that healthy. Great recipe omomo!! You made this so special with all of those unique flavors and ingredients! It looks fabulous, and it I’d take it over take-out pizza any day! Pinned. Awww thanks for pinning Marcie!! Such interesting flavors on this pizza. I love that is is quick to make and looks look tasty. It was really quick Lynn!! My favorite meal! I’m ALL about pizza and flatbreads lately, and this one sounds amazing and super unique, definitely a must try! Thanks Linda! Hope you enjoy this! You got me at easy meal hahaha!! 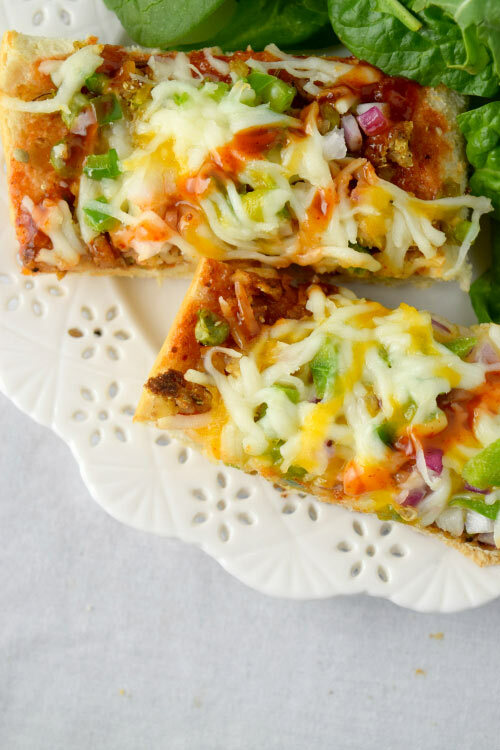 We love pizza so we need to try this French bread version soon. It looks amazing!! You should Oriana!! Hoping to year back how you liked it! This sounds and looks so flavorful! Love anything with the word ‘pizza’ in it!